Here I’m going to speak about one of the most beautiful and important pieces to be found in Palermo: La Vucciria by the Sicilian painter, Renato Guttuso. Old Don Tano Bongiorno may look like a worn old man and my wife says I’m messy too. She had to fashion a huge sort of bib or apron for me to wear when we eat. I never was much of a fashion plate anyway, but she doesn’t think having my shirt and vest stained with pasta sauce and vino looks good. She thinks people will blame her for not taking better care of me. I may look like an old man outside, but inside, I’m still that happy-go-lucky kid who grew up running around the Vucciria Market when I wasn’t in school. And I still have an eye for beauty too. I don’t just mean an eye for a beautiful girl with flashing eyes, but for fine art too. After all, here in Palermo, we are surrounded by beautiful and timeless pieces of art. And one of the most beautiful and important pieces to be found in Palermo is La Vucciria by our very own Sicilian painter, Renato Guttuso. I understand he painted many important works that strove to combat Fascism but my favorite is La Vucciria. After all, we both grew up near this ancient marketplace. It’s not the bustling place I knew as a kid. But Don Renato captured the feel of bygone days for that beautiful, active marketplace in his famous painting and I love it. This morning I spent nearly an hour staring at this, the most beautiful painting I’ve ever seen in my long lifetime. Now, I don’t say that just because I’m a full-blooded Sicilian. And if you’ve read some of my articles, you know I don’t exaggerate. I always try to tell it like it is, even if what I write about Palermo isn’t always complimentary. I’m not qualified to talk about the technical workmanship that went into this painting, but when I stand looking at it, something about this impressive work of art brings out everything that is most meaningful in all of Italy. Today, you can view this work at the Palazzo Chiaramonte. Known as the Palazzo Steri (from the Greek Hosterium, meaning fortified palace). The powerful Chiaramonte family built this palace. 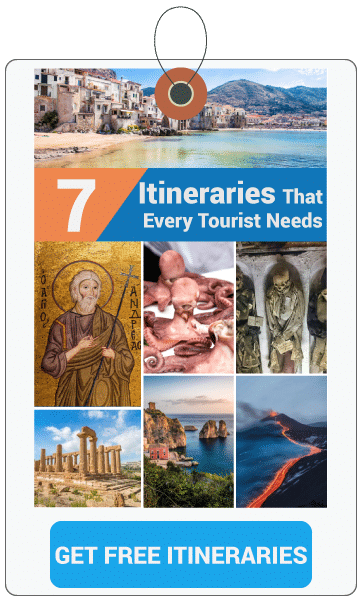 Over the centuries this has become one of Palermo’s most important attractions. Apart from the original family, the Palazzo later became a residence and headquarters for different factions over the years. Between late 1500 and well into 1517, Spanish viceroys occupied this residence. Between 1600 and 1782 the Holy Inquisition made this its headquarters and official seat from which the inquisitors handed down judgment. Outside in the square, Piazza Marina, many government opponents lost their heads. Today, with all the pomp and death sentences left behind in history, Il Palazzo Steri has become a popular museum housing the rectorate of the University of Palermo. 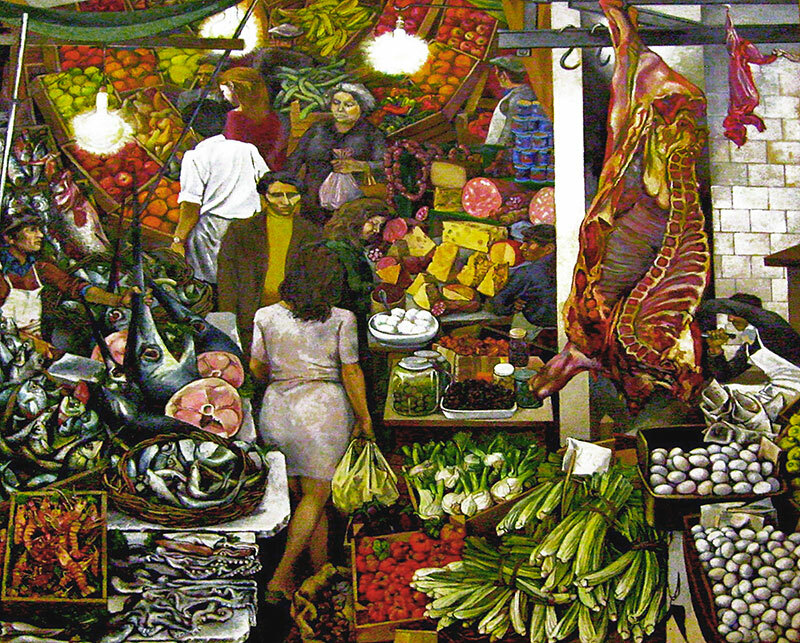 The museum hosts many works of art, including, of course, La Vucciria by Renato Guttuso. La Vucciria is not Don Renato’s only masterpiece, yet to me, it tops the list. This fascinating work of art immediately plunges the viewer back into the everyday life that swirled throughout the marketplace known as Vucciria. At that time, La Vucciria had to be one of Palermo’s most active and exciting marketplaces and an absolute heaven to a curious kid who scurried about with others like a pack of rats, sticking our noses into every corner and yes…we did often come away with an apple or a banana tucked inside our shirts. Bad boys and girls, one and all. I’m happy to say that most of us outgrew that phase of our childhood, and became honest citizens. 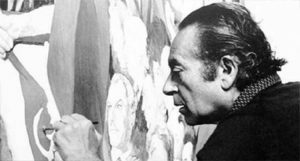 Renato Guttoso painted La Vucciria in 1974. Here, at least, it is considered his most famous painting. Don Renato boldly designed his vision of Vucciria’s active past in the raw yet bloodless realism that brings back the life the meat hanging in the famous Palermo market. After all, this name highlights the very structure (of lack of structure) of the Palermo market. Begun in early times by Arabs who occupied our city, the marketplace still recalls something of an Arab souk. In years gone by, souks were to be found all over around Sicily born of the culture of those who occupied Sicily for some hundred years, the Arabs. The visitor is caught up immediately by the mass of people milling about, the food and the color. Passers-by rub elbows with one another, apparently accustomed to this due to the narrowness of the spaces that run along between stalls. Looking down, it may only be possible to glimpse the cobblestones by the feet of a lovely woman wearing a blue dress. For all that, the chaotic haphazard structure of the marketplace which vaguely distorts this entire little world has been captured and brought to warm and realistic life by the painter Renato Guttuso. Even the chromatic rosy color of the swordfish gives the viewer such a realistic impression that you can almost smell the ocean. This particular emphasis on the wealth of food, its colors and shapes appears to be attached to the painter’s memory. After all, Don Renato, like me, as a child used to run about in the market, starving, always keeping an eye open for a bit of free food. Later he was to explain that his hunger made him see every single bit of food as colorful and succulent; sights and smells he was never to forget. More than simply a place for traders to do business, this important market is one of four large and historical marketplaces, among the many other, smaller markets that are to be found throughout Palermo. Vucciria continues to be a hub as well as an important tourist attraction. Aside from Vucciria, the three other large marketplaces are Capo, Borgo Vecchio, and finally, possibly the oldest of all, Ballarò, in the heart of the city. Expect the clamor, the din, and smells and the bustle of the market. Seeing this, rather than paint a two-dimensional painting on his canvas, Don Renato chose to use a 3×3 meter format. I hope you’ll come to have a look at this Vucciria painting. Just head out to Palazzo Steri Chiaramonte at Piazza Marina, 61. Open daily from 10 a.m. to 7 p.m. (except for Monday).